About Oscar Lathlin Collegiate - Opaskwayak Educational Authority Inc.
Oscar Lathlin Collegiate (Grades 7 to 12) officially opened up its doors on April 18th, 2011. It was an opening OEA and the people of OCN had long awaited! The modern facility has many technological benefits for our student population. Each classroom hosts “SMARTBoards” and is equipped with many computers for student usage. The open concept in the design makes the main corridor and classrooms inviting and visually appealing. The floor plan was designed in a way that allows our students to mix and mingle with their peers and staff alike. Our ‘pods’ are broken down into three main sections; the Junior High Area (6 classrooms offering ELA, Math, Science and Social Studies; the compulsory Senior High classes (6 classrooms offering a myriad of courses in English, Mathematics, Science, Social Science); a centrally located computer lab; and a ‘pod’ in which we teach most of our optional courses (Cree, Native Studies, Outdoor Education, Video Productions and a Transitional Class). We are also equipped with a ‘state of the art’ Home Economics Lab, and a well-equipped Woods Technology classroom that has CAD capabilities. Our Gym is centrally located on the opposite side of the ‘pods’ making it the ideal place to host school and community events. We offer a fully accredited program with many unique, school initiated, community based courses. Our land based Outdoor Education program is designed to re-connect our students with the land. We currently offer this program to all of our students from grades 7 through 12. The students go out on the land and learn about our culture, and how to protect and conserve nature. We also offer an entrepreneurship program which was brought to us through the assistance of The Right Honourable Paul Martin. The goal of the Grade 11 and 12 Aboriginal Youth Entrepreneurship Program is to encourage Aboriginal youth to stay in school where they can develop the attitudes, knowledge and skills necessary to achieve success in secondary school, postsecondary education or training, the workplace and daily life. Students are given entrepreneurial experience and the opportunity for business ownership. click here for more information. We believe that the continuation of our Cree Language is important and have been offering it as a regularly scheduled class to Grade 7 to 9. We also require the student to have at least one Cree language credit in order to graduate from Oscar Lathlin Collegiate. 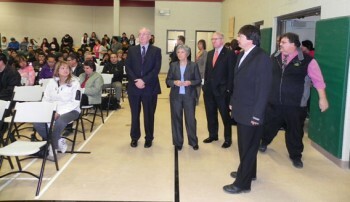 In addition, we also offer Cree to Grade 10, 11, 12 students as a challenge credit. We are currently emphasizing the development of our Library. As a new facility, we need resources to fill its shelves. Text submitted by: Ron Constant, Principal, Oscar Lathlin Collegiate.